Amazed. That's what I felt the first time I did it. I am talking about moving objects with your mind. A few years back, I was introduced to the topic of moving a pendulum by using the power of the mind. A pendulum, by the way is any object that hangs by a string. Like a pendulum you find in a pendulum clock. However in this case, the object should be symmetrical or round and light weight. What you do is simple. First, just hold the end of the string with your fingers as shown in this picture. Next, with the power of your mind, and without moving your hand, will the pendulum to swing to the right and then left, to and fro. Then again with the power of the mind, will it to stop swinging. I tried this back then, but it was not successful. The pendulum simply would not move. And so I thought it was all nonsense and forgot about it. It so happened that the other day, I was cleaning up my room when I spotted the pendulum again. I thought why not give it another try this time? And what do you know? I made the pendulum swing! I could hardly believe it! But guess what? After I willed it to stop, which it did, I tried and get it to swing towards me instead. And it did exactly that! It swung towards me, then away from me in the other direction, and then back again. I was like, Oh my God, is this real? Just to prove it was no fluke, I got it to stop. It stopped swinging almost immediately. I willed it to swing left to right again, and it did! Once again, I got it to stop and willed it to swing towards me and away from me. I repeated this process many times and each time, it did not fail to swing at the direction I willed it to. So was it the power of my mind? Or did I unknowingly move my hand so that the outcome was what I wanted? I really don't know. Maybe it was both. Upon further reading on this subject on the Internet, I discovered pendulum can be used to detect water or minerals, to locate lost objects or people, and even to access our subconscious or higher consciousness. This may sound like utter nonsense to many people, or even paranormal to some, but I can assure you there are certainly some truths to it. Now why don't you give it a try and let me know if you can make the pendulum move? For more experiments using pendulum, read Test Your Dowsing Skills by Michael Daniels, Phd. thats interesting! harry potter in the making ar.. :D but again..where can get it? Whoa cool. I need to try that but first I need to get recover my mind dulu ... LOL! That is interesting, Foong. I must try that. I know that when you are behind someone at a distance and you focus staring at the person's nape (back of neck), he will get the vibe and turn back to look at you. I have tried that. Vibes is an interesting subject. Haiz! I was thinking what "pendelum" you're talking about! Hahahahahaha!!! wow. you could prob do that to amaze the kids at parties. good work! 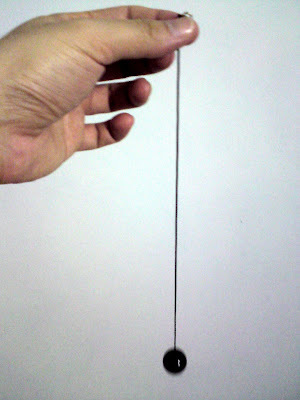 However, to save money, you can actually make your own pendulum. Just use a ring and tie a string to it. The ring should have some weight (not too light) and be able to swing freely. You can get it online or make your own. Refer to my reply to victor above. suituapui, what pendulum are you referring to? Wah, lets go to Genting and make a lot of money from the Jackpot machine. Share 50-50 ok. LOL. Seriously, I do believe in the power of the mind! interesting...first time I heard of this theory. Maybe I'll try this out when I've time to kill. Seems interesting. Got to try myself! Some one demonstrate that to me years ago, and he actually use that to read fortune. I dont believe. r u sure its not illusion that the pendulum moved? Are you sure you're from Earth? sounds cool but i'm afraid it might turn my mind upside down trying it. LOL! life ramblings, it won't turn your mind upside down, haha! Just give it a try - you'll be amazed! I cannot do it! Probably my brain too tired. Will try again. You should've used a video camera Foong, that'll be nice to see. I'm no skeptic and I believe these things are real. I'll have to try this. eastcoastlife, I can't do it every time. It happens when you least expect it. Don't concentrate too much, but just relax and let go. quachee, cut chopsticks using paper? Wow! I want to learn how to do that! get someone to hold a japanese chopstick. then you take a piece of paper in your hand and aim on the chopsticks. think hard - about what you want. somehow you'll feel the force into yr hands. Hmm...interesting! But does the pendulum needed to be made from special materials? Perhaps one which have magnetic field? Perhaps you would like to visit my website to learn about the way I work with a pendulum.